The team’s discoveries include the closest and brightest fast radio bursts ever detected. Their findings were reported today in the journal Nature. Fast radio bursts come from all over the sky and last for just milliseconds. Scientists don’t know what causes them but it must involve incredible energy—equivalent to the amount released by the Sun in 80 years. “We’ve found 20 fast radio bursts in a year, almost doubling the number detected worldwide since they were discovered in 2007,” said lead author Dr Ryan Shannon, from Swinburne University of Technology and the OzGrav ARC Centre of Excellence. For each burst, the top panels show what the FRB signal looks like when averaged over all frequencies. The bottom panels show how the brightness of the burst changes with frequency. The bursts are vertical because they have been corrected for dispersion. Credit: Ryan Shannon and the CRAFT collaboration. The team’s next challenge is to pinpoint the locations of bursts on the sky. “We’ll be able to localise the bursts to better than a thousandth of a degree,” Dr Shannon said. Dr Ryan Shannon (Swinburne/OzGrav), Dr Jean-Pierre Macquart (Curtin/ICRAR) and Dr Keith Bannister (CSIRO) describe their discovery of 20 new fast radio bursts (FRBs) and how the Phased Array Feed (PAF) receiver technology in CSIRO’s Australian Square Kilometre Array Pathfinder (ASKAP) radio telescope enabled this breakthrough science. Credit: CSIRO. Playing a key role in the international Square Kilometre Array (SKA) project, the world's biggest ground-based telescope array. Or is it from ICRAR via Australia’s Science Channel? 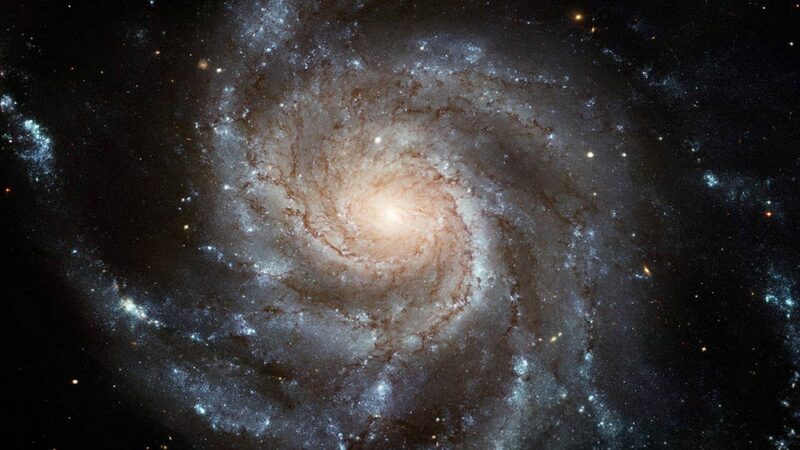 From the biggest to the smallest, galaxies all rotate at the same rate. “Discovering such regularity in galaxies really helps us to better understand the mechanics that make them tick — you won’t find a dense galaxy rotating quickly, while another with the same size but lower density is rotating more slowly,” he said. But the latest research, published today [MNRAS] , evens the score between the two galaxies. In research published today [MNRAS], the international team of scientists used the telescopes to observe a nearby radio galaxy known as Centaurus A. “We used the Murchison Widefield Array (MWA) and Parkes—these radio telescopes both have large fields of view, allowing them to image a large portion of sky and see all of Centaurus A at once. The MWA also has superb sensitivity allowing the large-scale structure of Centaurus A to be imaged in great detail,” he said. A ‘radio colour’ view of the sky above a ‘tile’ of the Murchison Widefield Array radio telescope, located in outback Western Australia. The Milky Way is visible as a band across the sky and the dots beyond are some of the 300,000 galaxies observed by the telescope for the GLEAM survey. The Centaurus A radio galaxy is visible to the right of the image. Red indicates the lowest frequencies, green the middle frequencies and blue the highest frequencies. Credit: Radio image by Natasha Hurley-Walker (ICRAR/Curtin) and the GLEAM Team. MWA tile and landscape by Dr John Goldsmith / Celestial Visions. The MWA is a low frequency radio telescope located at the Murchison Radio-astronomy Observatory in Western Australia’s Mid West, operated by Curtin University on behalf of an international consortium. The Parkes Observatory is a 64-metre radio telescope commonly known as “the Dish” located in New South Wales and operated by CSIRO. Observations from several optical telescopes were also used for this work— the Magellan Telescope in Chile, Terroux Observatory in Canberra, and High View Observatory in Auckland [no view available]. Centaurus A observed at 2307 MHz by the the Parkes radio telescope, as part of the S-PASS survey. Credit: E. Carretti and the S-PASS team. Centaurus A observed at 154 MHz by the Murchison Widefield Array. Credit: ICRAR/Curtin. CSIRO Astronomy and Space Science (CASS) operates the Australia Telescope National Facility (ATNF), comprising a set of world-class radio-astronomy observatories including the Parkes 64-metre radio telescope and the Australia Telescope Compact Array (ATCA) in New South Wales, and the Australian Square Kilometre Array Pathfinder (ASKAP) in Western Australia. 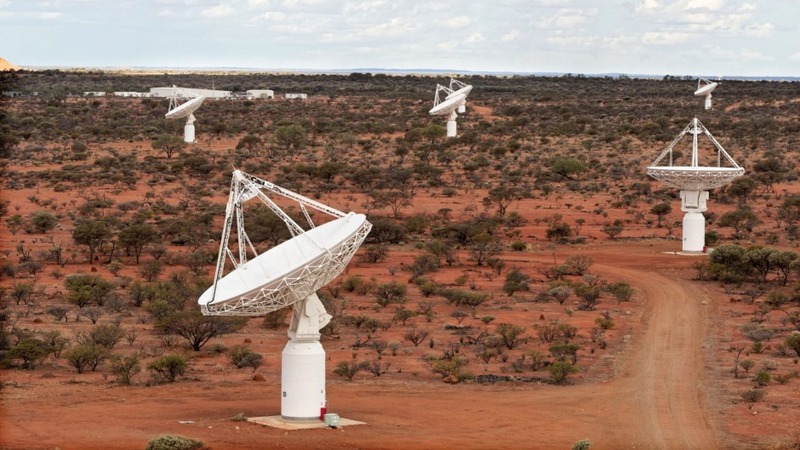 Using the Murchison Widefield Array (MWA), a radio telescope located in the Murchison region of Western Australia, the team successfully detected two molecules called the mercapto radical (SH) and nitric oxide (NO). “The molecular transitions we saw are from slow variable stars—stars at the end of their lives that are becoming unstable,” said Chenoa Tremblay from the International Centre for Radio Astronomy Research (ICRAR) and Curtin University. Since the 1980s, frequencies greater than 80GHz have been used for this type of work due to the freedom from radio frequency interference emitted by our mobile phones, televisions and orbiting satellites. But the extreme “radio quietness” of the Murchison Radio-astronomy Observatory, where the telescope is located, allows astronomers to study molecular signatures from stars and star-forming regions at lower frequencies. “Before this study, the mercapto radical had only been seen twice before at infrared wavelengths, in a different part of the electromagnetic spectrum,” said Dr Maria Cunningham from the University of New South Wales. “This shows that molecules are emitting photons detectable around 100MHz and we can detect these molecular signatures using the MWA—it’s very exciting for us,” she said. Following on from the pilot study, a survey of the Orion region is now in progress, again using the MWA, in the frequency range of 99-270MHz. The Orion nebula is a chemical-rich environment and one of the closest star-forming regions to Earth. The aim is to detect more chemical tracers in stars, compare these regions to the observations from the Galactic Centre pilot region and to better understand the emission mechanisms of these molecules. “This new technique paves the way for deeper surveys that can probe the Milky Way and other galaxies in search of molecular precursors to life,” said Tremblay. 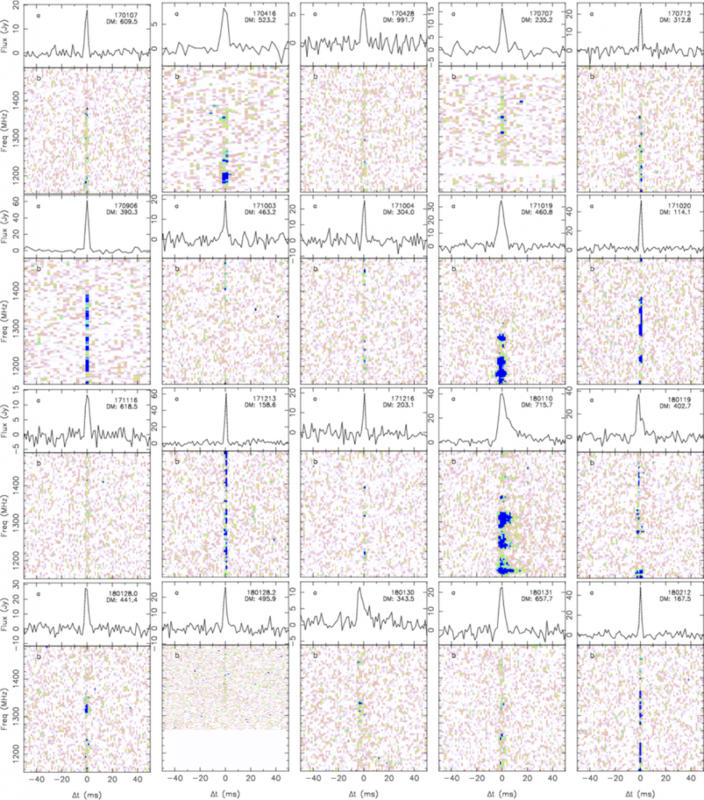 A First Look for Molecules between 103 and 133MHz using the Murchison Wideeld Array, published in the Monthly Notices of the Royal Astronomical Society on July 21, 2017. This image from NASA’s Spitzer Space Telescope features the Large Magellanic Cloud, a satellite galaxy to our own Milky Way galaxy. Overlaying the image are circles showing the locations of 15 star clusters where multiple generations of stars have been discovered. Credit: Karl Gordon and Margaret Meixner – Space Telescope Science Institute/AURA/NASA. Compilation by Bi-Qing For and Kenji Bekki (ICRAR/UWA). Dr Bi-Qing For, from the International Centre for Radio Astronomy Research in Perth, said our understanding of how stars evolve is a cornerstone of astronomical science. “There are a billion trillion stars in the Universe and we’ve been observing and classifying those we can see for more than a century,” she said. Because star clusters are assumed to contain stars of similar age and composition researchers have used them as an “astronomical laboratory” to understand how mass affects the evolution of stars. “If this assumption turns out to be incorrect, as our findings suggest, then these important models will need to be revisited and revised,” Dr For said. The discovery, published today in the Monthly Notices of the Royal Astronomical Society, involves a study of star clusters located in the Large Magellanic Cloud, a neighbouring galaxy to the Milky Way. 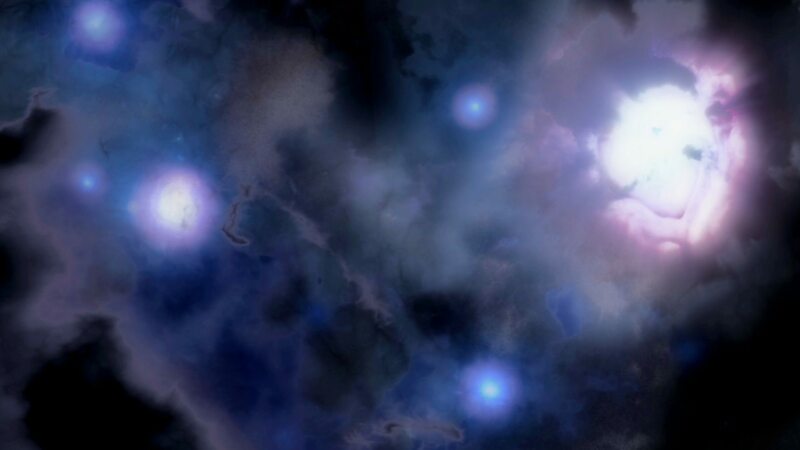 “The formation of these younger stars could have been fuelled by gas entering the clusters from interstellar space,” said co-author Dr Kenji Bekki, also from the International Centre for Radio Astronomy Research. “But we eliminated this possibility using observations made by radio telescopes to show that there was no correlation between interstellar hydrogen gas and the location of the clusters we were studying. “They have been observed using infrared wavelengths by orbiting space telescopes Spitzer and Herschel, operated by NASA and the European Space Agency,” he said. Thunderstorms are common in the Murchison region of Western Australia in January but for Luke Horsley the 21 millimetres of rain that drilled into the red dirt overnight are problematic. It is 6am in an old stone cottage at Boolardy Station. Horsley grabs the receiver of a black landline telephone and tells a colleague 330 kilometres away in Geraldton not to make the bumpy four-hour drive from the coast. The roads might be closed. The landline, which would look commonplace in any city office, stands out at Boolardy. Horsley may be working as an engineering support technician at a $400 million high-tech facility but using a mobile phone or even a humble Wi-Fi network is not an option. The radio waves they produce would obliterate the science he is working on – radio astronomy. 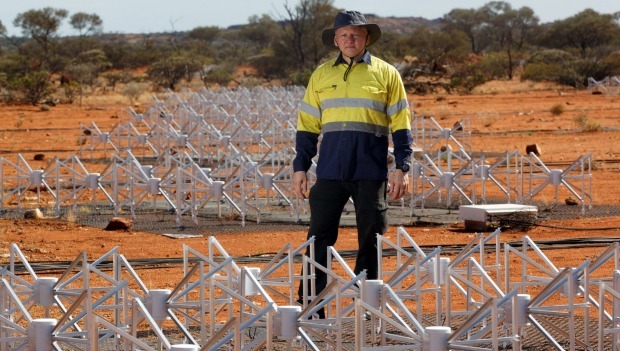 Horsley and his colleagues are here in the middle of nowhere working on the world’s largest science project – the Square Kilometre Array (SKA). A multibillion-dollar endeavour first dreamt up in 1991, the SKA is in essence a vast radio telescope that will literally look back through time to the dawn of the universe. To call its mission ambitious is to redefine understatement – the SKA aims to resolve some of the most profound unanswered questions of our time. Was Einstein right about gravity? When did the first stars, galaxies and black holes form? What is dark energy? And, quite possibly, are we alone in the universe? To achieve this ten countries have joined forces to build the SKA – a telescope so large it will eventually have a collecting area of more than a million square metres. Australia won the right to host part of the project in 2012 after a hotly contested 8-year bidding process conducted by the SKA Organisation, the not-for profit dedicated to overseeing its design, construction and operation. South Africa will share the prize, ultimately hosting 2000 dishes probing the universe as far as six billion light years away. And here in the red dust of the Murchison a million individual antennas, each resembling a Christmas tree, will eventually tune in to the faint signals from the very edge of the universe – “light” emitted by events more than 13 billion years ago. It is the day before the thunderstorm and here in the low-lying mulga scrub even the racehorse goanna look like they’re over the 38-degree temperatures and enervating humidity. Until a few years ago Boolardy was a cattle station and my visit coincides with that of the former manager and his daughter, here to round up the last escapee livestock. The Murchison shire, which is roughly the size of Denmark, is an ideal site for radio telescopes. It is so isolated it describes itself as “the shire with no town” – and claims to be the only one in Australia. 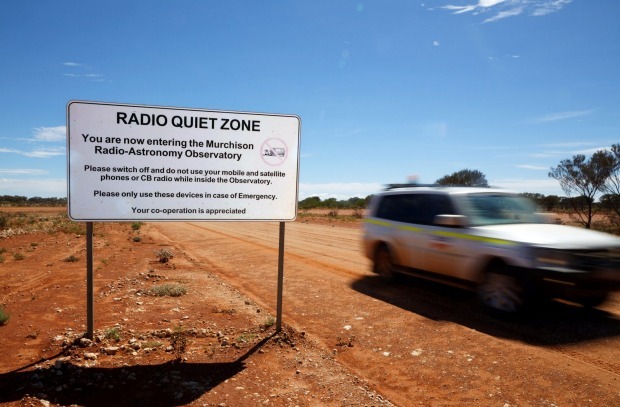 During the SKA bidding process the Australian government protected it with a 260-kilometre “radio quiet zone”. 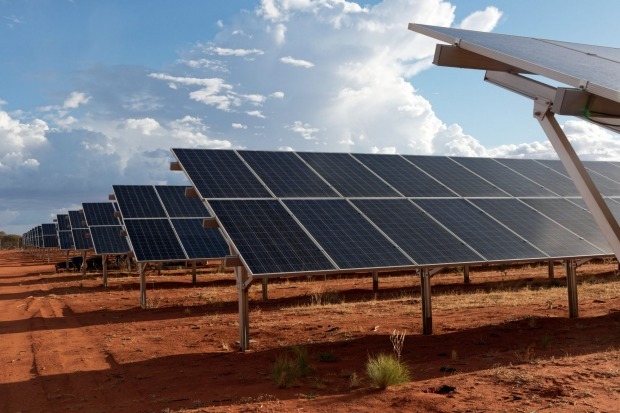 Given the 50,000-square-kilometre area is home to just 113 people – most in the local Pia Wadjarri Indigenous community as well as a few remaining station owners – the chances of unwanted radio activity are slim. Still, visitors aren’t encouraged. An “emergency flipchart” on the wall of a site office has instructions for dealing with an “unaccounted visitor” alongside “fire and explosions” and a “bomb threat response”. Disrupt the science at your peril. In the airvconditioned comfort of a control building buffered by two double-door “airlocks”, CSIRO experimental scientist Dr Balthasar Indermühle is working on a radio-frequency interference (RFI) monitoring system he is building. 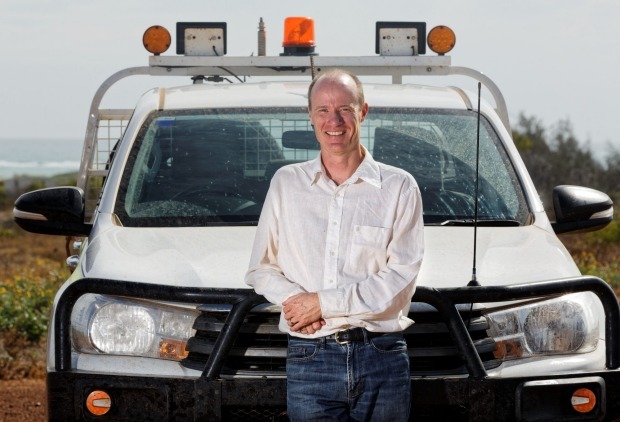 The Swiss-born scientist is here from his home in Sydney and his job is to keep the two radio telescopes that currently occupy the Murchison Radio-astronomy Observatory (MRO) as clean of radio interference as possible. Indermühle was an airline pilot in Switzerland. Flying through the sky at night is about as close as you can get to space travel without leaving the planet and from his vantage point in the cockpit, he would regularly contemplate the universe. After exchanging airplanes for software development and founding a company called Inside Systems, Indermühle was drawn back to the night sky. Having already tinkered away at a Masters in astronomy online, he left for Australia to undertake a PhD in astrophysics at the University of New South Wales. Indermühle’s main interest lies in making this pursuit as easy as possible by minimising the amount of “earth noise” the radio telescopes pick up. This is no easy feat. To detect such weak radio signals from space, the telescopes need to be ultra-sensitive. “The entire energy that has been received by all the radio telescopes on the planet since the beginning of radio astronomy, the energy equivalent of that is ash from a cigarette dropping one centimetre in height,” Dr Indermühle explains as we circle one of the dishes hard at work. “That is how sensitive our equipment is. We could see a mobile phone that is a light year away.” A mobile phone on the moon heard via these telescopes would be booming, let alone one at Boolardy. 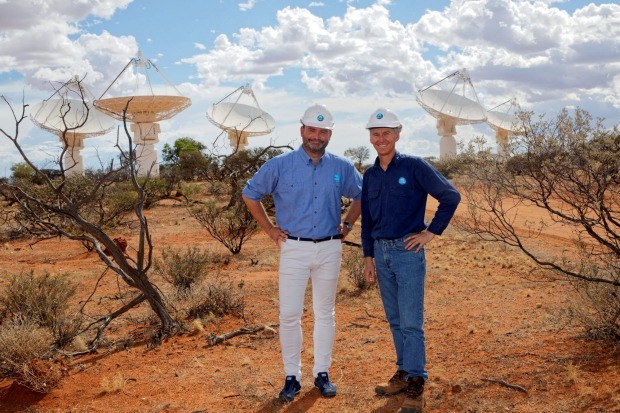 Indermühle is one of a small crew of engineers and scientists, from the CSIRO and The International Centre for Radio Astronomy Research (ICRAR), who are pushing the frontiers of astronomical science at the MRO, which will host the SKA and is already home to the MWA and ASKAP telescopes. Horsley, his ICRAR colleague Mia Walker and Dutch intern Ric Budē are braving the heat at the MWA to undertake repairs and prepare for the rollout of an expansion. The remainder of their team, former firefighter Dave Emrich and intern Kim Steele, who was part of a “student army” that helped build the array and is now working on the project full time, are in the MRO’s control building working on the spaghetti strands of cables that feed the data from the MWA into a complex computing system. Steele’s own journey is about to take a new turn when she jets off to Finland to undertake her PhD. Everywhere else is dead quiet. If a mechanic told you he only understood about 5 per cent of your car, you wouldn’t be filled with confidence. Unfortunately, this is the awkward situation astronomers are in. “Astronomers are incredibly ignorant of the universe we live in,” explains ICRAR executive director Peter Quinn, an astrophysicist who once worked on the Hubble Telescope with NASA. “There’s about 95 per cent or more of it that’s been called ‘dark’.” Roughly 25 per cent of that is considered dark matter and 70 per cent dark energy. Scientists have little idea what they are. 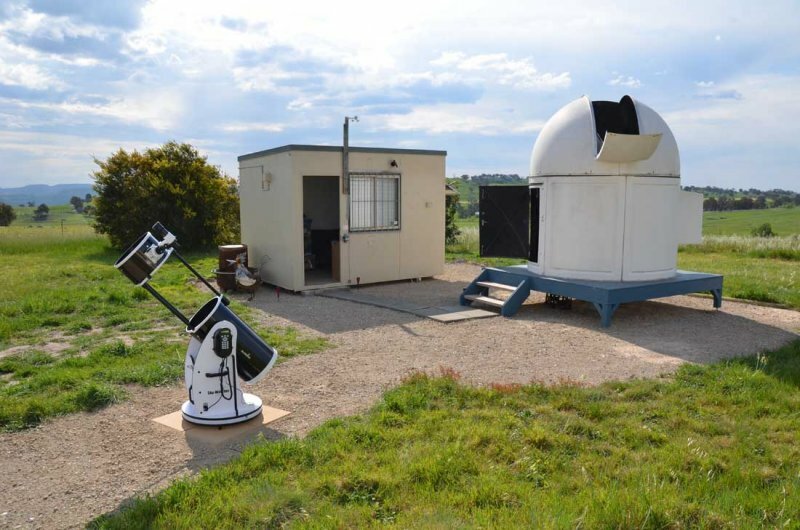 Quinn heads up ICRAR in Perth, a research facility set up specifically to help interpret data from the Murchison telescopes and run jointly by Curtin University and the University of Western Australia. It is part-funded by the WA government. Like so many of the others I meet while researching the SKA, Quinn’s journey into the deep space world has – much like the project itself – had unlikely stops and starts but never been short of interesting. Quinn began at the University of Wollongong and moved on to the prestigious California Institute of Technology before joining the Hubble institute at NASA’s Space Telescope Science Institute in Baltimore. He returned to Australian National University to lead a global search for dark matter. His work did indeed find early evidence of dark matter and in 1991 graced the cover of Nature. From there Quinn went to the European Southern Observatory headquarters in Munich and ultimately to ICRAR. He has spent the bulk of this career trying to crack the “dark” mystery. “I wanted to understand why all these galaxies looked like they looked,” Quinn tells me. “Why are some round and some flat and some green and some blue? When you start down that path, you all of a sudden realise what you’re looking at is just the frosting on the cake. “What the universe really made is all this black stuff which sits underneath. This dark stuff is driving everything, its presence, its shape, its physics. If you want to understand galaxies, you have to understand this dark stuff. He is hopeful the SKA might provide an end to the “frustrating search” during his lifetime. Resolving this mystery is one of the five core science drivers of the project. After the Big Bang, which is thought to have occurred about 13.7 billion years ago, the universe was transformed from an expanding ball of hot particles into a cool sea of gas, predominantly hydrogen. This is thought to have occurred over about 380,000 years. Inflation to gravitational waves derived from ESA/Planck and the DOE NASA NSF interagency task force on CMB research, Bock et al. There was no light during this time, aptly known as the Dark Ages, so no optical telescope has ever been able to observe this phase of the universe’s evolution. At some point – probably about 400 million years after the Big Bang – there was the “cosmic dawn” when the first galaxies and stars are thought to have burst into existence. But it took until about 1 billion years after the Big Bang for radiation from those stars and galaxies to clear the hydrogen “fog” and allow light to escape. That period of about 600 million years is known as the “Epoch of Reionisation” and it is one of the last frontiers in cosmology. The MWA telescope is already working to define what happened. It may sound impossible to delineate something so massive but it works like this. Human eyes can only collect and focus a certain range of the electromagnetic spectrum – what we call visible light. But in order to understand the universe, we need to study astronomical objects over the broad range of wavelengths they emit – from the gamma rays emitted from emerging stars to the radio waves released from black holes. Radio waves are simply “invisible” light and astronomers have developed telescopes to pick up this light in wavelengths ranging from a fraction of a millimetre to metres long. The more sensitive the telescope, the clearer picture it can create of weaker signals. The older the signal, the weaker it is because it has stretched out as it has travelled – just like when you look at the sun, you are seeing it as it was 8.2 minutes ago because that is how long it takes sunlight to travel to Earth. Therefore, the most powerful radio telescopes are essentially time machines. For scientists like MWA director Randall Wayth, time travel comes with its challenges. Wayth, a software consultant who followed his passion to become an astrophysicist, says the Epoch of Reionisation project is the most challenging project the telescope is seeking to complete. He returns to the Epoch of Reionisation. At first glance the 2048 squat, spider-like antennas that constitute the MWA radio telescope are not at all impressive. But it is the MWA that has the honour of reaching back to the cosmic dawn and directly informing the design of the SKA’s future low-frequency antennas, which will be much more powerful. The MWA receives signals within the 80 to 300 megahertz bandwidth, the same low frequencies we typically broadcast FM radio and television signals on. It has been surveying the southern hemisphere since 2013. 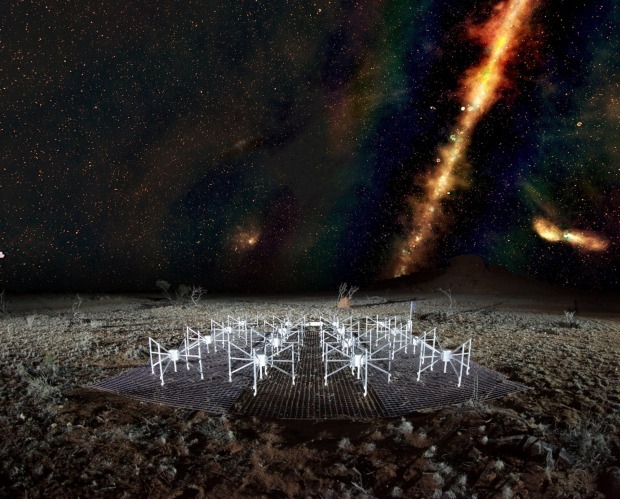 “The MWA would detect the Epoch of Reionisation and see things within it, but then the SKA would come along and see it in much greater resolution,” says Wayth. So what has the MWA found in it’s three years of searching the southern skies? A big part of the answer is its GaLactic and Extragalactic All-sky MWA (GLEAM) survey. GLEAM produced a catalogue of 300,000 galaxies, picking up radio waves which, when translated into images, showed the sky in 20 primary colours – far better than the three humans can manage. With these images astronomers are already planning where to zoom in on when SKA comes online next year. Wayth and Emrich have similar backgrounds. Both studied electrical engineering, with Emrich tacking on computer systems and Wayth computer science. After years as a professional engineer and then bush firefighter, an opportunity came up for Emrich to apply his background to a persistent passion of his, astronomy. He can trace his fascination with space back to his grandparents who took him camping in Hyden, a small town about 300 kilometres south-east of Perth popular with tourists because of its large wave-shaped rock, when he was a child. “They used to take us out to Wave Rock and Hyden and things to look at the sky at night,” Emrich recalls. “I remember gramps rattling the tent at 3am when we were all asleep and saying ‘you have to have a look at this’ and all of us grumbling about how early it was. He has been involved in the MWA project since 2009 and says he has lost count of how many times he has travelled to the Murchison observatory, probably close to 100. His wife and three teenage children – who live in Perth – don’t mind the time away as much as they did when he was battling bushfires across Western Australia – at least these trips are planned in advance. Patricia Kelly is as responsible as anyone for Australia being chosen to co-host the SKA. A career public servant whose early work included developing social policy, Kelly’s journey took a turn towards science when she she moved to the Industry department in 1995 and began working with the research sector and on innovation policy. In 2007 she became involved with the SKA bidding process through her role as deputy secretary responsible for the department’s science and research streams. Today Kelly chairs the Australia-New Zealand SKA Co-ordination Committee (NZ remains involved despite missing out on hosting the science) and is Australia’s representative on the board of the international SKA Organisation, which includes members from Australia, Canada, China, India, Italy, New Zealand, South Africa, Sweden, the Netherlands and the United Kingdom and is co-ordinating the whole project. The SKA is to be constructed in two phases. The first phase, SKA1, will constitute about 10 per cent of the full array and is about three-quarters of the way through its final design phase. SKA1 will see about 200 dishes rolled out in South Africa’s Karoo, a lightly populated semi-desert region north of Cape Town, including 64 dishes known as “MeerKAT” that have been acting as a local precursor project. The dishes will cover the 350MHz to 14 gigahertz range of the spectrum. In Australia, about 130,000 low frequency antennas will be constructed to cover the 50 to 350MHz range. Although the MWA’s “spiders” have been informing their design, the SKA antennas more closely resemble Christmas trees. The cost of constructing SKA1 has been capped at €675 million, with operations expected to cost another €100 million a year. Phase two will see the collective array expand to more than its namesake square kilometre, with a total 2000 dishes in South Africa and other African countries, including Botswana, Ghana and Kenya, and a staggering one million Christmas tree antennas creating a forest above the Murchison scrub. It is undoubtedly a huge endeavour with a significant cost. But everyone AFR Weekend speaks with is confident there will be payoffs beyond understanding what happened a long time ago in a galaxy far, far away. Wi-Fi was the result of CSIRO radio astronomers seeking to detect tiny, exploding black holes. A scientist at CERN, the European Organisation for Nuclear Research, invented the World Wide Web in 1989 to meet the demand for information sharing between scientists. Hierarchical Segmentation software developed by NASA is now used in medical imaging. Surely the SKA will be no different. Kelly, who is also the director-general of IP Australia, says it is most likely the SKA’s spin-offs will be things we are not able to predict. “Certainly the amount of data the telescope will generate and how to handle that data will be something that will generate a great deal of information and learning,” Kelly says. January has been an exciting month for the CSIRO’s Antony Schinckel. 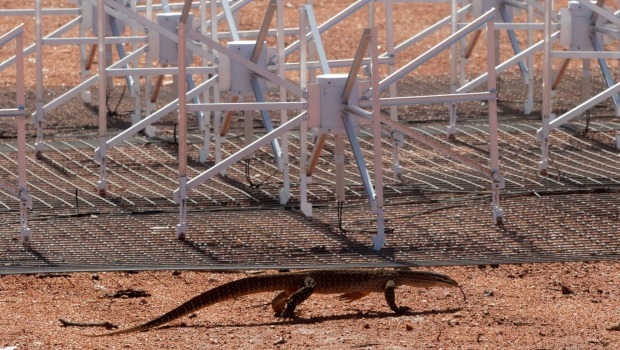 The man responsible for the design, construction and commissioning of the $165 million ASKAP telescope has just seen it click into top gear after extensive testing. And already the results, and the way they are being processed, is encouraging. 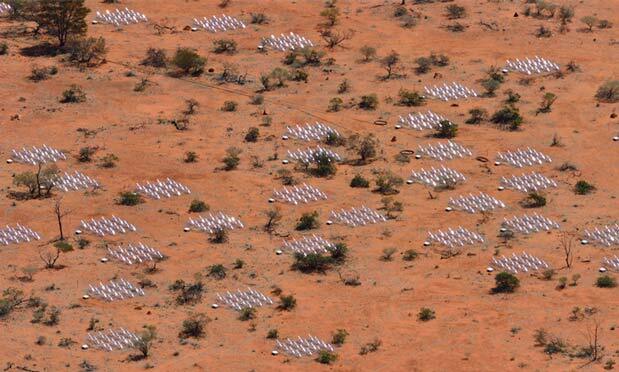 ASKAP, Australian Square Kilometre Array Pathfinder, is the more familiar looking telescope at Murchison. It consists of 36 large, white dish antennas that work together as a single instrument. Each one bears a local Wajarri name – including Bundarra (stars), Wilara (the Moon) and Jirdilungu (the Milky Way) – an honour also afforded to Schinckel himself. The ASKAP telescope is mapping space out to about 3 billion light years away, using neutral gas to reveal hundreds of thousands of galaxies. The project, expected to take five years, is creating mind-boggling amounts of data. Even operating well below its full capacity the antennas are now churning out 5.2 terabytes of data per second. That’s about 15 per cent of all the data bouncing around the internet on any given second. From the telescope, the data goes down an 800km fibre optic cable to the Pawsey Supercomputing Centre and into a new, near automatic data-processing system Schinckel and his team have developed. 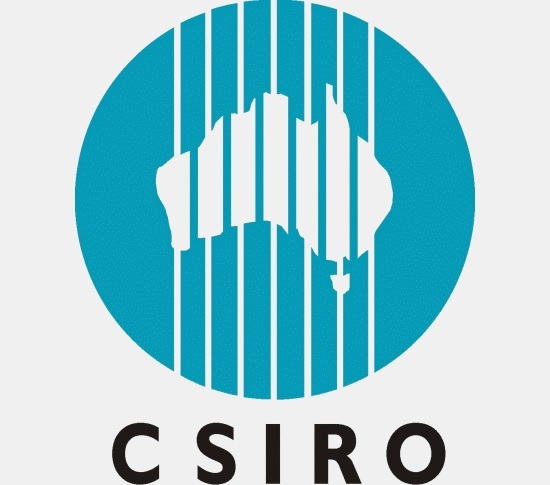 While the ASKAP will not be directly used in Australia’s end of the SKA (that job’s for the “Christmas trees”), it as an important demonstrator of a key technology the CSIRO has designed and is being considered for the SKA mid-range telescopes to be rolled out in South Africa. Called a phased array feed (PAF), the technology is essentially an advanced version of a traditional radio telescope receiver, which detects and amplifies radio waves. Traditionally receivers have only been able to take snapshots of small pieces of the sky at once but the PAFs, with 188 individual receivers positioned in a chequerboard, allow a dramatically wider field of view. Schinckel, who spent 17 years at high-profile observatories in Hawaii, says the CSIRO has already sold one PAF to the Max Planck Institute for Radio Astronomy in Germany and is building a second for the Jodrell Bank Observatory in England. The next step could be its use in other fields. “In many ways we don’t know enough to know what those other uses might be,” Schinckel says. “They might be in medical imaging, for example, in tomography. It might be in ground imaging from aeroplanes or satellites. It could be in communications in cities where you have extremely high density communications and there are limits that that imposes. We simply don’t know at this juncture. “When you typically look back about five or ten years after a telescope was built, and you look to see what was the really exciting science that came out of it, often only about 30 per cent of the science that’s come out of it was what you had predicted or planned right back at the start,” he says. Making sure the SKA has the computing power and data processing systems to handle the deluge of data is the big challenge for ICRAR’s director of data intensive astronomy, Andreas Wicenec. Phase one of the SKA alone will produce five times 2015’s global internet traffic. The data collected in a single day would take nearly two million years to play back on an iPod and will require the power of computer processing systems around ten times the size of today’s biggest machines. The challenge of ensuring the SKA can process this unprecedented volume of data in near real-time is being tackled by institutes and companies across the globe, including tech powerhouses Amazon, Intel, IBM and Cisco Systems which are all providing input into how the systems should function. From Perth, Wicenec is sharing valuable insights with the SKA design teams from the data journey of the spidery-MWA. He is also taking a leading role in designing the “brain” of the SKA – the science data processor. 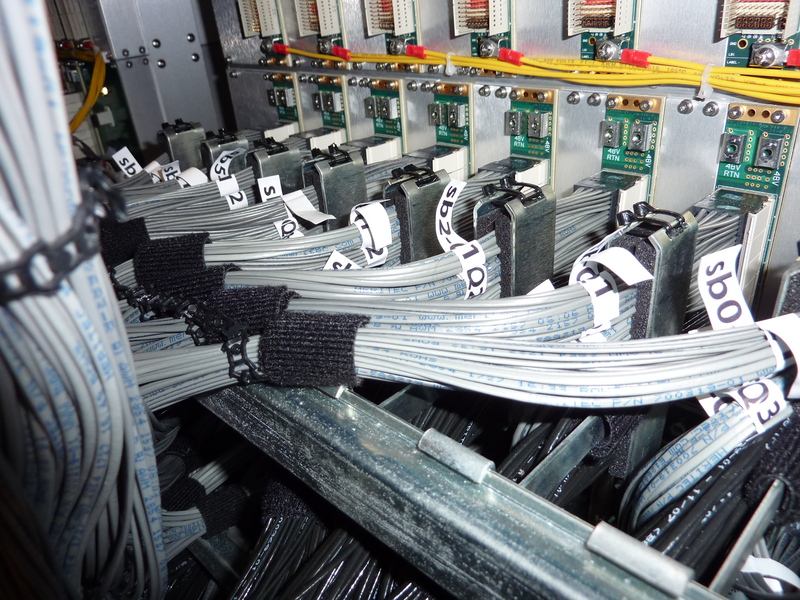 After a correlator on site at the MRO has conducted a first filter of the mass of data, reducing it in size, it will travel down the fibre optic cable to Perth’s Pawsey Supercomputing Centre. In terms of data flow, the MWA is a factor of 20 larger than the last project Wicenec worked on, the Atacama Large Millimeter Array in Chile, an ambitious array perched atop a plateau more than 5000 metres above sea level. “That’s already a big step but what we are talking from MWA to SKA is actually a factor of 1800 in terms of data flow,” Wicenec says, explaining the SKA’s jump in scale also delivers an increase in resolution, compounding the data deluge. And if that wasn’t hard enough, scientists from across the globe, ranging from the Onsala Space Observatory in Sweden to the National Centre for Radio Astrophysics of India, need the data to be sent out again. “We are actually sending about three to four times more data out [from the MWA] than what we are receiving, so that means about a good gigabyte or 1.2 gigabytes a second out to people every single day,” Wicenec says. If you think managing tradies on your home renovation is tough, spare a thought for David Luchetti. As general manager of the Australian SKA Office, he heads the agency responsible for co-ordinating Australia’s commitment to the project – everything from federal funding to site access – and has unrivalled knowledge on its progress. For a public sector veteran who took on the role with little understanding of astronomy, building knowledge of the science has been a learning curve. He says the biggest challenge in a role co-ordinating a highly complex, multibillion-dollar project has been to keep momentum going on its many and varied streams of work. There’s finalising the design, securing funding, signing the Indigenous Land Use agreement and liaising with the WA government. Luchetti says the global effort is like a duck, “it’s quite serene on top but there is a lot happening below the surface”. He has also been responsible for translating “scientist” into “politician”. A key hurdle for sciences such as astronomy is to translate researchers’ excitement about the unknown into funding. The idea of “we will find something or there will be a spin-off but we can’t tell you what it will be” does not sell easily. 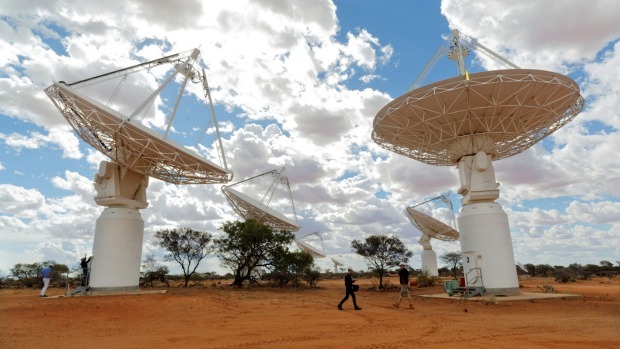 The Australian government has understood the vision, contributing about $400 million to SKA-related activities to date, with the West Australian government spending about a further $111 million on radio astronomy, most linked to the SKA. Premier Colin Barnett says the SKA could add more than $100 million to the state’s economy over the next 20 years through locally supplied goods and services. And managing all those terabytes of data would bring valuable experience to WA. But what about the aliens? The first thing that comes to many peoples’ minds when they think about what else could be out there is aliens. Is there other intelligent life? SKA could provide an answer. The man heading the entire SKA project, Phil Diamond, director general of the SKA Organisation. “The public think that [looking for aliens] is what we do,” Diamond says. “It is not actually what radio astronomers do. However, SKA will be the most capable machine that human kind has ever developed to hunt for that signal from intelligent extraterrestrial civilisations. “We do have people within our science working groups who are focused purely on that aspect but it is definitely not the main stream of what we do. Enormously is an understatement. If an artificial signal which suggests intelligent life, for example a distant airport, is detected by the SKA, another radio telescope would be used to verify the signal. And then, Diamond explains there is actually an astronomical protocol for how it should be dealt with. For Diamond, a 35-year radio astronomer, his key interest is not in the extraterrestrial but rather how our own galaxy has evolved. “I am quite interested in the theme we have dubbed ‘the cradle of life’ which will look at how planets form and evolve, detecting the molecular signals of amino acids and things like that in space,” he says. But before the science, Diamond has a big job on his hands. “We are dealing with more than 600 scientists and engineers in more than 10 countries… people in almost every time zone you can imagine from New Zealand to Western Canada and all the cultural and language differences that go with that,” Diamond says. “Pulling all of that together has been one of the biggest challenges. I do say to my staff here that the communications in this project will be perfect the day we switch the telescope off,” which is expected to be about 50 years after it fires up. The SKA Organisation has two key focuses at the moment – signing off on a final design and inking a binding SKA treaty between the 10 member countries, committing them to funding and contracts for the commencement of construction, targeted for late-2018. But even Diamond admits hitting that construction target will be a tough ask. “That is going to be very tight,” he says. “There are multiple things that have to happen before we can start construction. On the design side we have to deliver a design that has been validated and is ready to go out to industry for tender. On the other side the governments have to deliver a convention, the governance structure and the legal organisation that enables us to receive money from the governments and go out and pay industry. Diamond can control the design process but the speed of the governments is out of his hands. For example, all of the Brexit legislation that has to go through the British government could slow the nation ratifying its end of the treaty. As it reaches the end of the design process, the SKA Organisation is also re-examining its €675 million cost target for the construction of SKA1. “Like all major scientific projects like this, our cost estimates are coming in a little higher than we had hoped,” Diamond says. About 30 per cent to be exact. While all of that is a long way from the MWA team assembling more spidery antennas in the scorching heat of the Murchison, there is a palpable excitement that their telescope could now play an even bigger role in the world’s largest science project. As they make the 40km drive back to Boolardy from the MRO, lightning flashes overhead. Everyone is praying the storm doesn’t target its science – last year it claimed thousands of dollars worth of antennas atop CSIRO’s radio interference tower. The night passes and while the lightning has not been an issue, the rain has. Horsley was right to be worried, all but one of the roads has been closed. And the forecast for tomorrow is no better. The ICRAR team cuts their site trip three days short and piles into the back of rented four-wheel drives, dodging lizards and kangaroos on their way back to Geraldton. The radio waves are from 13 billion years ago, they can wait another month. The reporter travelled to the MRO courtesy of ICRAR. The sciencesprings blog is shown on Twitter. The Twitter feed for this post resulted in 63 retweets.